I’m excited to share this character portrait of Tsu-Yin Aasha Hou Kapoor, She Who Knows Ten Thousand Things. 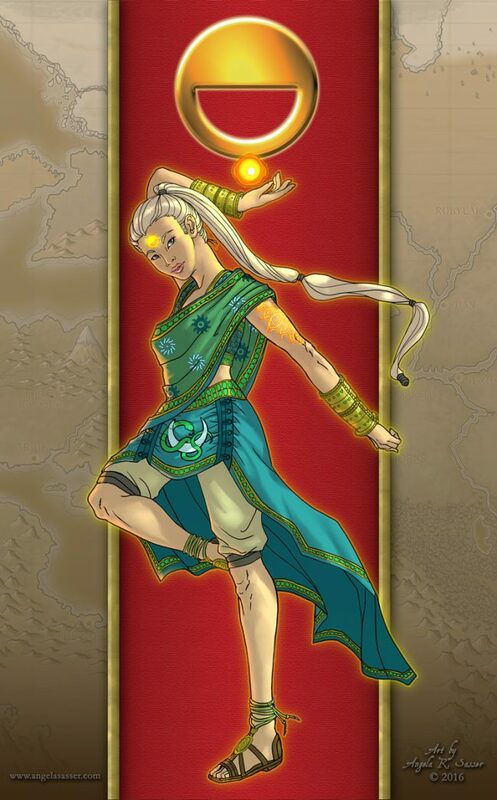 Daughter of high-born sorceresses and chosen of the Unconquered Sun, Tsu-Yin left a life of comfort to pursue epic adventures and a grand destiny as a Solar of the Twilight Caste! She’s from the same tabletop roleplaying game as my character, Kalara, if you all recall meeting my gunslinging businesslady earlier this year. 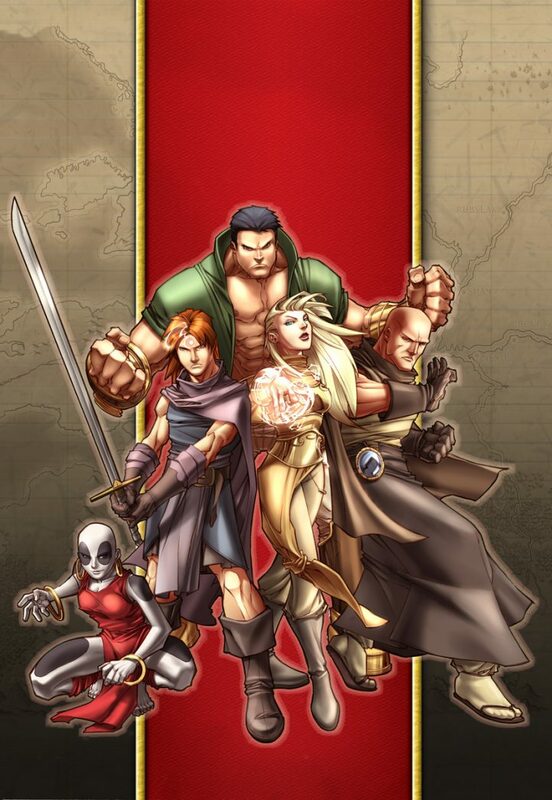 Exalted is such a fun game full of amazing Eastern-inspired imagery and epic level action! 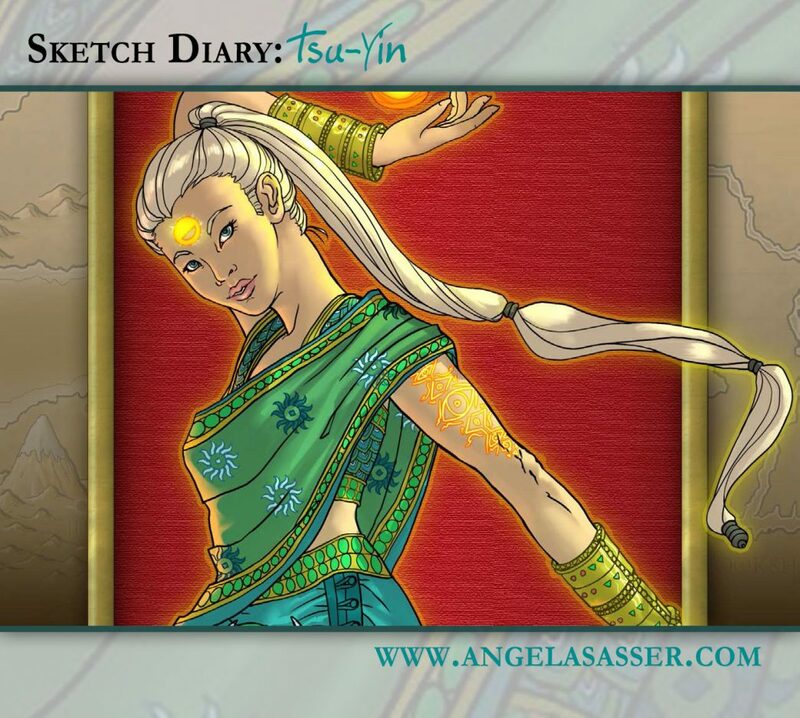 For Tsu-Yin, my brainstorming began with the many beautiful references of Indian clothing and character drawing references provided by Tsu-Yin’s creator, Minis-sketchbook. 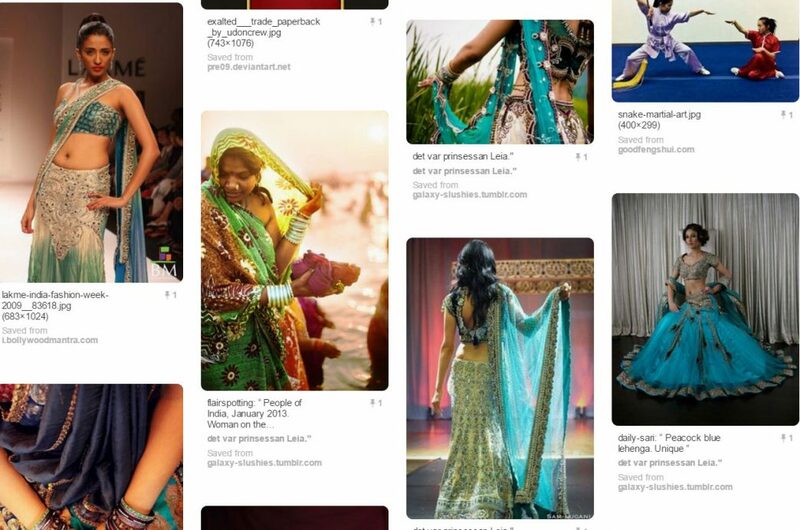 Tsu-Yin’s mood board on Pinterest. Tsu-Yin was described as excitable and energetic. She comes from a life of comfort and is finally able to see the world for herself. 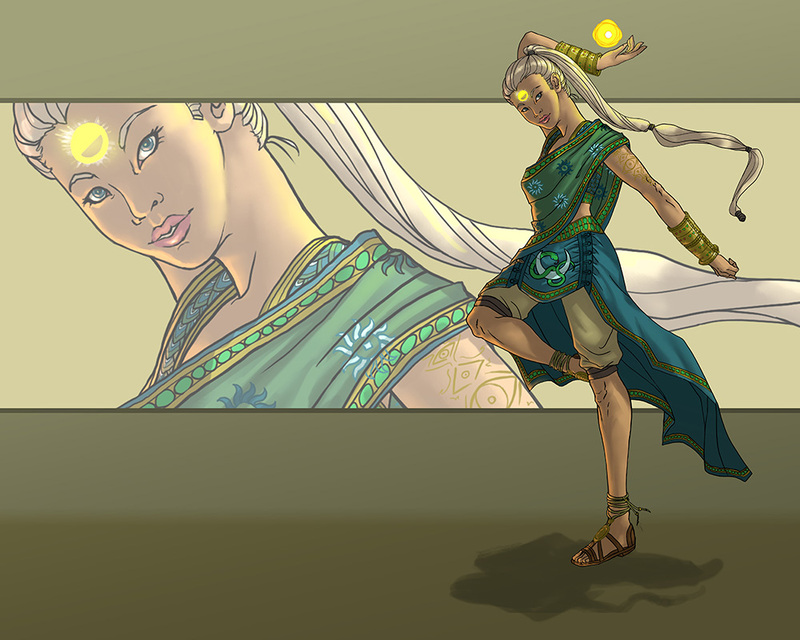 She’s also a martial artist with a snake-inspired style as well as a sorceress. I knew from her concept I wanted a friendly and optimistic pose, something more energetic than whimsical. 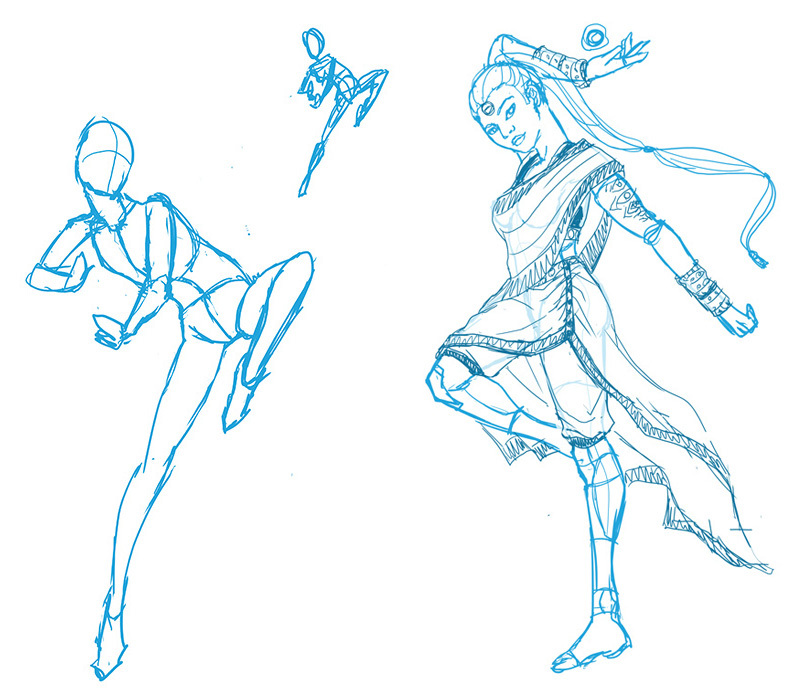 Brainstorming began with a sheet of gesture sketches to help me discover Tsu-Yin’s personality through pose. Finding a good compromise between energetic and aesthetically pleasing was pretty challenging! None of my initial poses really fit her perfectly. I eventually ended up with the following pose on the left that was pretty off the wall. I thought the oddness of it suited Tsu-Yin perfectly, but I just couldn’t get the anatomy to work out! Rather than obsess over the anatomy and miss my deadline, I decided to save the pose for another time when I could focus on really getting that anatomy perfect (more fan art of Tsu-Yin coming in the future, maybe?). 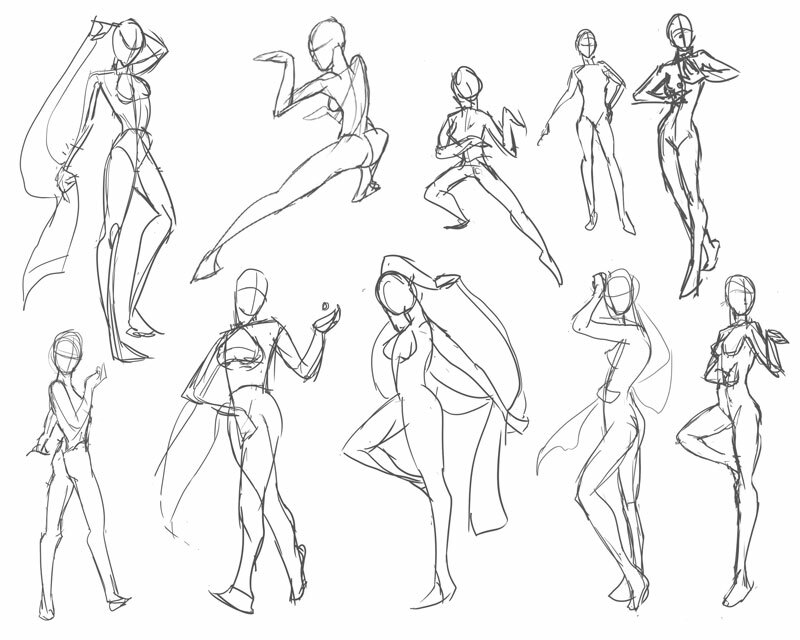 Eventually, I returned to one of my other favorite poses on the gesture sheet and took that to the next step, breaking down the major shapes of the anatomy and roughly sketching in the clothing. The dancing quality of the pose fit well with her Indian-inspired roots and I thought it was a fun way for Tsu-Yin to be casting a spell, while the aesthetic look of the pose allowed me to show off her tattoos and flowing hair and clothing. Getting Tsu-Yin’s facial features right was the next challenge! 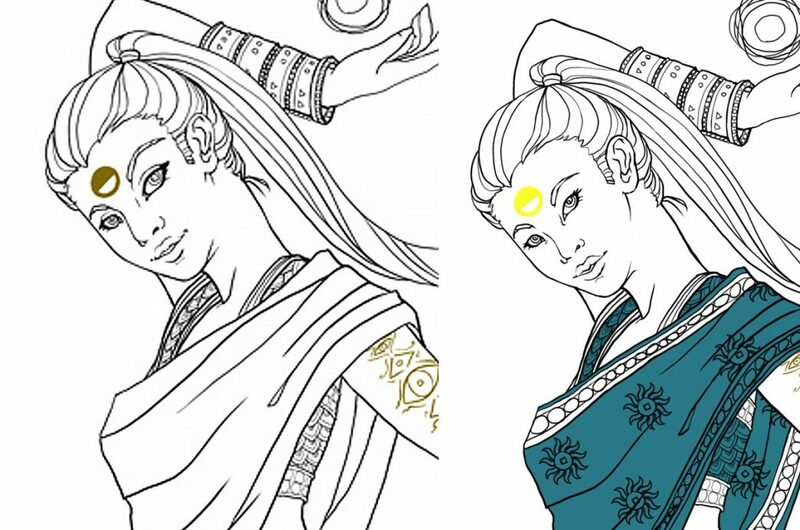 She’s described as an Indian-inspired character, but also drawn as Asian-looking in her reference images. My initial sketches were far too Caucasian and cartoonish looking. I re-drew the face many times before finally arriving at the final product. What really helped me get her eye shape right was to dedicate to draw the epicanthic folds above her eyelids without a lot of detail and to emphasize the pointed shape of her inner eye. It also helped to round off her cheek and face and give her a much flatter nose. This excellent tutorial on drawing epicanthic folds helped me out quite a lot for Tsu-Yin’s final look! As for Tsu-Yin’s fashion, she’s described as someone who dresses in finery, thanks to her wealthy family, which meant I could go crazy with intricate clothing and jewelry. Bangles and a saree style sash harken back to her Indian-inspired roots, while the scale shapes in her shirt remind of the snake as a visual motif. The snake also shows up in the snake and moon emblem in her skirt. I also designed a skirt with button and loop seams to give her costume a more unique touch. Figuring out how to present this portrait so it wasn’t just a character on an empty boring background was quite challenging! My first try was at a horizontal look with a vignette detailing her face. It was nice to show off all the detail in that face since I spent so much time on it! In the end, I was inspired by the official artwork for Exalted that featured a red tapestry with gold trim. This would help tie the portrait into the Exalted universe that inspired her, as well as provide an interesting backdrop that worked a little better than the wallpaper style one. View the image online here. Like my art? 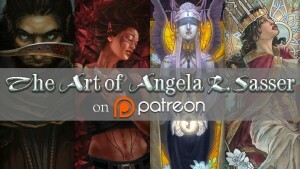 Sponsor me on Patreon for exclusive rewards! You’ll get sneak peeks, premium tutorials, and much more!